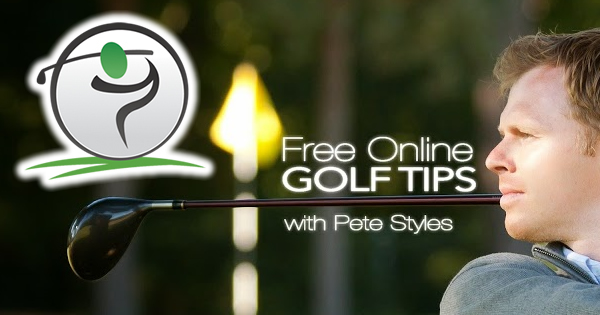 The golf ball can and is usually positioned differently in relation to the club at hand. There are two main competing philosophies regarding this. 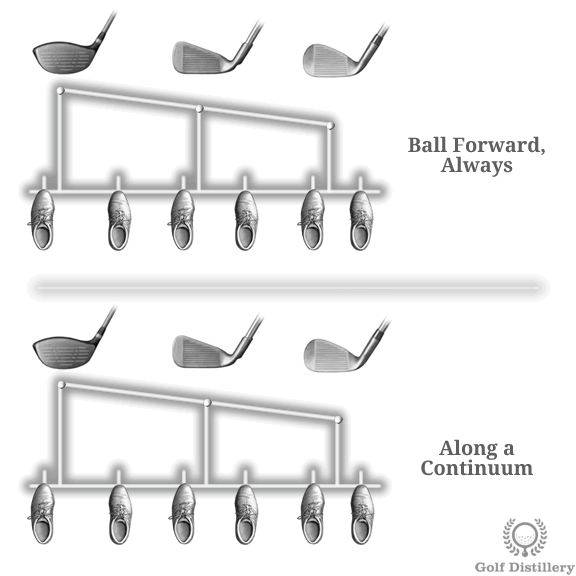 One recommends to position the ball forward always while the other recommends to move the ball along a continuum in relation to the club at hand. Both are explained below. Ben Hogan, as well as Jack Nicklaus and Greg Norman (amongst others) advocate placing the ball forward in the stance always, no matter which club you are using. What will change instead is where you place your right foot and the general guideline here is the longer the club the furthest away that right foot will be located. 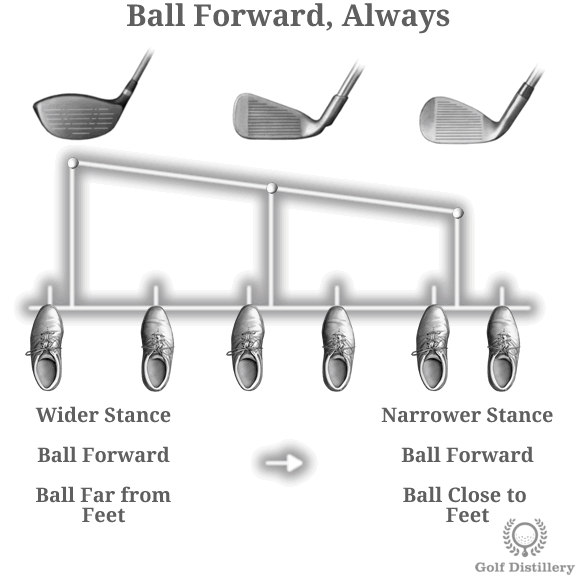 Or in other words, the longer the club, the wider the stance and therefore the further back you should place your right foot. The main argument to using this ball positioning scheme is that it promotes consistency. It does so because the ball is always located on the same spot relative to the left foot. 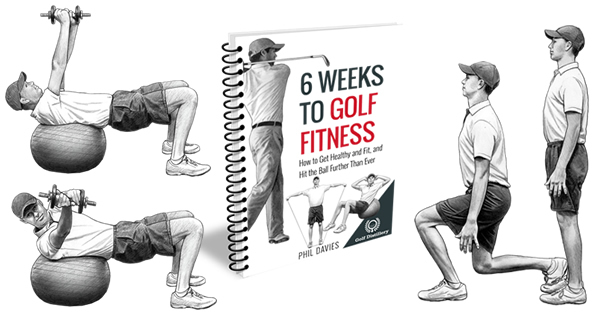 This consistency in ball location helps gain a certain level of confidence and allows the brain to concentrate on other areas of the golf swing. On the flip side, because the ball is always forward in the stance it can lead to risks of mishits on its own. Indeed, positioning the ball forward can lead to fat shots – or skulled shots – if the bottom of the swing arc does not match this ball position. For example, a swing arc that bottoms out before impact may work for drives that are meant to struck the ball on the way up but it will not work with wedges for example, which will produce chunk shots or even skulled shots. In this instance, it is best suited to those that can and prefer to see impact happen forward in the stance. The main alternative to placing the ball on the same line in relation to the left foot is to move the ball on a continuum from the left heel to the center of the stance. 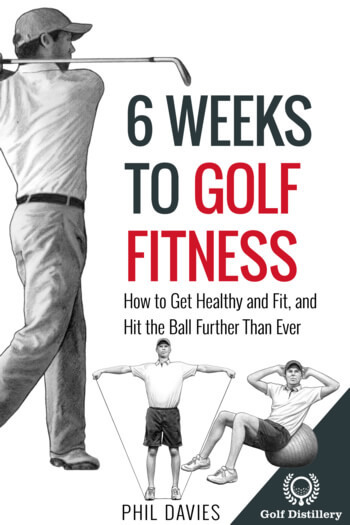 Indeed, this competing philosophy states that the ball should be in the center of the stance for wedges and short irons and be moved forward progressively as the club lengthens and the distance to the ball increases. Similarly, the longer the club, the wider the stance. This is what is generally taught in golf lessons these days. The main argument to using this scheme is that it differentiates between clubs that are meant to hit the ball on the way up and those that are meant to hit down on the ball. Indeed, drivers and fairway woods are meant to hit the ball while they are rising whereas short iron and wedge are best used when they hit down on the ball, a process known as trapping the ball. The main drawback is found in the adjustments that are needed for each shot (and club) and the possibility that the ball will not always be positioned where it should be. Indeed, the margin of error in positioning the ball on the correct location for each and every shot is greater here than it is when you always position yourself so that the ball is forward in the stance. This can lead to instances where a ball should be found forward but is instead found in the center of the stance, for example. The number of decisions a golfer has to make during a round is pretty high already. Adding another one to the pre-shot routine can lead golfers to simply forget to set up properly. This ball positioning mechanism is best used by golfers who are always able to concentrate and focus during the setup and to do so throughout an entire round.